Sir J. Dashwood's Petition referred to Judges. It is Ordered, That the Consideration of the said Petition be, and is hereby, referred to the Lord Chief Baron of the Court of Exchequer and Mr. Justice Page; with the usual Directions, according to the Standing Order. 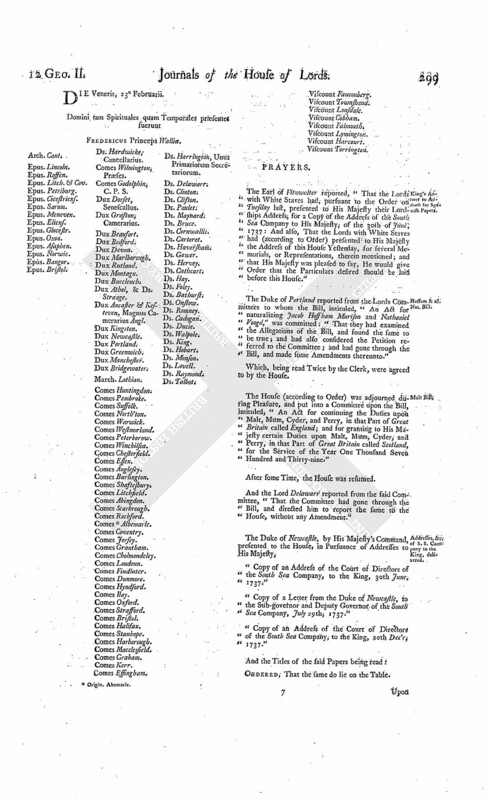 Upon reading the Petition of Benjamin Periam Gentleman; praying, "In regard Thomas Heath, Plaintiff in a Writ of Error brought into this House the last Session of Parliament, to which Francis Short is Defendant, hath not assigned Errors within the Time limited by their Lordships Standing Order; that the said Writ of Error may be Non pros'd, with such Costs as to the House shall seem meet:"
Commons give Mr. Stert Leave to attend. The Messengers sent to the House of Commons on Tuesday last, to desire, "That they would give Leave to Arthur Stert Esquire, a Member of that House, to attend this House on Tuesday next, when the Convention concluded between Great Britain and Spain, and the separate Articles belonging thereunto, are appointed to be taken into Consideration," acquainted their Lordships, "That the Commons had given Leave to the said Mr. Stert to come to this House, if he thought fit, as is desired in their Lordships Message." 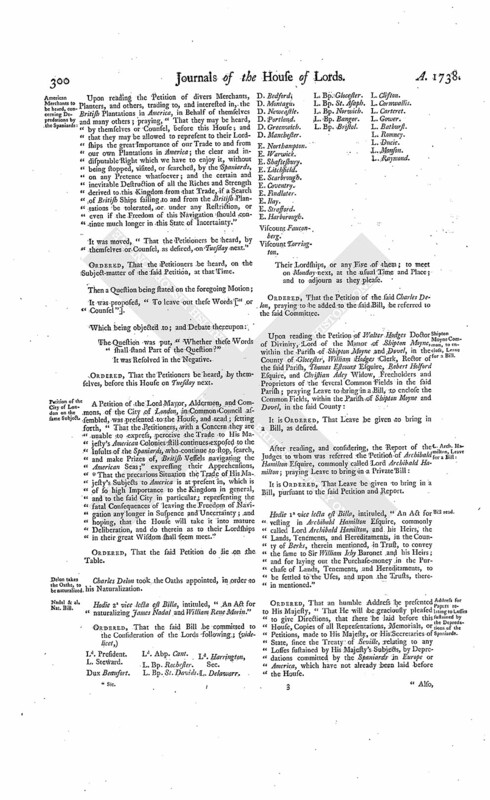 Upon reading the Petition of William Osbaldiston Esquire, Lord of the Manor, and Impropriator, of Hunmanby, in the County of York, and Richard Osbaldiston Doctor in Divinity, Dean of York, and Vicar of Hunmanby aforesaid, and also of several Freeholders whose Names are hereunto subscribed, in Behalf of themselves and other Freeholders within the said Manor; praying Leave to bring in a Bill, for confirming and establishing certain Articles of Agreement in the Petition mentioned; whereby it is agreed, "That the said William Osbaldiston, his Heirs and Assigns, shall hold and enjoy, in Severalty, a certain Piece of Ground called The Moore, staked out and bounded as described in the said Articles:"
It is Ordered, That the Petitioners have Leave to bring in a Bill, as desired. Sir J. Home against Sir J. Home. Upon reading the Petition and Appeal of Sir John Home, of Rentoun, Baronet; complaining of an Interlocutor of the Lords of Session in Scotland, of the 2d of this Instant February, made on the Behalf of Sir John Home, of Manderston; and praying, "That the same may be reversed, and such Relief granted the Appellant as to the great Wisdom of the House shall seem meet:"
It is Ordered, That the said Sir John Home of Manderston may have a Copy of the said Appeal; and he is hereby required to put in his Answer thereunto, in Writing, on or before Thursday the 22 Day of March next; and that Service of this Order on his Agents or Procurators before the said Court be deemed good Service. Memorials from Spain, and other Papers, Address for. Ordered, That an humble Address be presented to His Majesty, "That He will be graciously pleased to give Directions, that there may be laid before this House, a Copy of the Memorials, or Representations, delivered by Order of the Court of Spain to his Grace the Duke of Newcastle, dated 21st September /2 October, 1736, touching the Limits of Carolina and of Florida; with the Answers which have been given thereunto. Also, a Copy of a Memorial, or Representation, from the Commissioners for Trade and Plantations, to His late Majesty, or His Secretaries of State, dated the 20th of Dec'r, 1722, upon the Spanish Ambassador's Complaint, relating to a Fort then lately built by the Governor of South Carolina. "Also, a Copy of a Memorial, or Representation, from the Commissioners for Trade and Plantations, to His Majesty, or His Secretaries of State, dated the 20th of June, 1728, touching the State of His Majesty's Possessions in America disputed by the King of Spain. Also, a Copy of a Memorial, or Representation, from the General Assembly of South Carolina, to His Majesty, touching the State and Condition of that Province, dated the 9th of April, 1734. Also, a Copy of a Memorial, or Representation, from the Trustees for establishing the Colony of Georgia, in America, to Her late Majesty when Guardian of the Kingdom, dated the 20th of October, 1736, in Answer to the Memorial of Monsieur Geraldino, 21st September/2 October, 1736. And also, a Copy of a Memorial, or Representation, from William Bull Esquire, Lieutenant Governor of South Carolina, to the Commissioners for Trade and Plantations, dated the 25th of May, 1738, in Answer to the Memorial of Monsieur Geraldino, 21st September,/2d October, 1736." Persons to be naturalized take the Oaths. This Day Andrew Grote, Jacob Hackman, Cornelius Vand Waal, and Samuel Cley, took the Oaths appointed, in order to their Naturalization. Hodie 2a vice lecta est Billa, intituled, "An Act for naturalizing Jacob Hoffam Murison and Nathaniel Voogd." Viscount Fauconberg. Ld. Bp. Durham. L. Bp. Bristol. Ld. Delawarr. Ordered, That the Petition of the several Persons aforenamed, desiring to be added thereunto, be referred to the said Committee. Delon to be added to Nadal & al. Nat. Bill. It is Ordered, That the said Petition do lie on the Table, till the said Bill be read a Second Time. Kent against Whitby, in Error. The Lord Chief Justice of the Court of King's Bench, in the usual Manner, brought up a Writ of Error, wherein John Kent and James May are Plaintiffs, and Robert Whitby and Catherine his Wife Defendants. Hodie 2a vice lecta est Billa, intituled, "An Act for continuing the Duties upon Malt, Mum, Cyder, and Perry, in that Part of Great Britain called England; and for granting to His Majesty certain Duties upon Malt, Mum, Cyder, and Perry, in that Part of Great Britain called Scotland, for the Service of the Year One Thousand Seven Hundred and Thirty-nine." Ordered, That all the Lords be summoned to attend the House To-morrow. Dominus Cancellarius declaravit præsens Parliamentum continuandum esse usque ad & in diem Veneris, vicesimum tertium diem instantis Februarii, hora undecima Auroræ, Dominis sic decernentibus. King's Answer to Address for Spanish Papers. The Earl of Fitzwalter reported, "That the Lords with White Staves had, pursuant to the Order on Tuesday last, presented to His Majesty their Lordships Address, for a Copy of the Address of the South Sea Company to His Majesty; of the 30th of June, 1737: And also, That the Lords with White Staves had (according to Order) presented to His Majesty the Address of this House Yesterday, for several Memorials, or Representations, therein mentioned; and that His Majesty was pleased to say, He would give Order that the Particulars desired should be laid before this House." Hoffam & al. Nat. Bill. 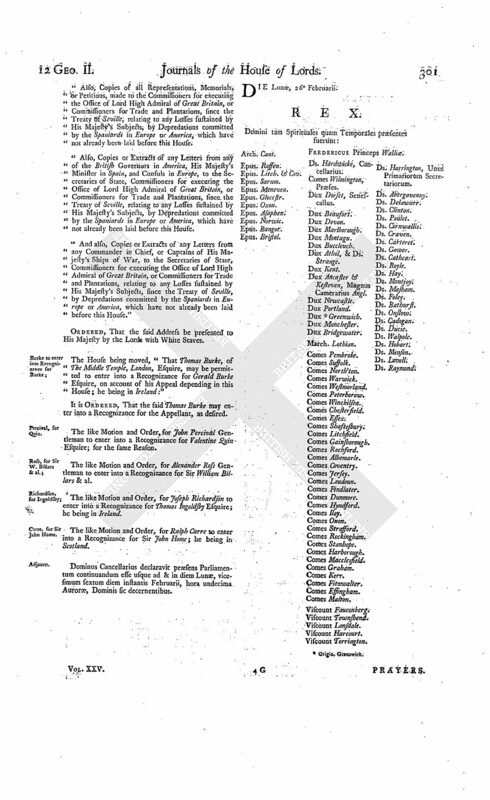 The Duke of Portland reported from the Lords Committees to whom the Bill, intituled, "An Act for naturalizing Jacob Hoffham Murison and Nathaniel Voogd," was committed: "That they had examined the Allegations of the Bill, and found the same to be true; and had also considered the Petition referred to the Committee; and had gone through the Bill, and made some Amendments thereunto." 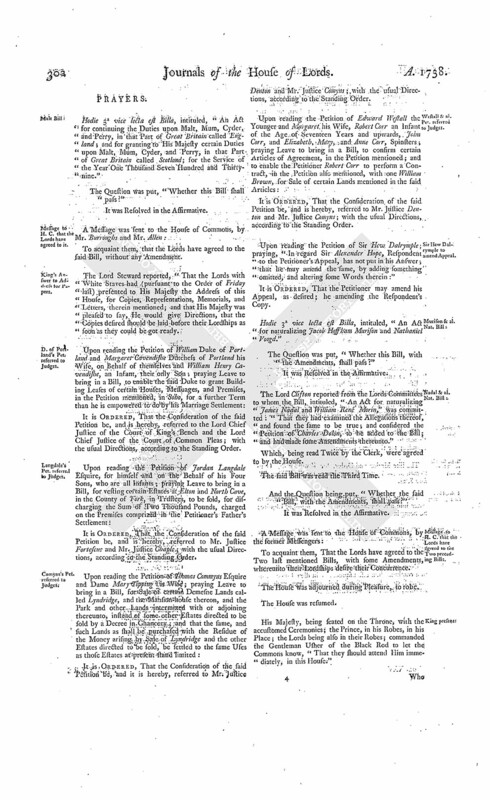 The House (according to Order) was adjourned during Pleasure, and put into a Committee upon the Bill, intituled, "An Act for continuing the Duties upon Malt, Mum, Cyder, and Perry, in that Part of Great Britain called England; and for granting to His Majesty certain Duties upon Malt, Mum, Cyder, and Perry, in that Part of Great Britain called Scotland, for the Service of the Year One Thousand Seven Hundred and Thirty-nine." And the Lord Delawarr reported from the said Committee, "That the Committee had gone through the Bill, and directed him to report the same to the House, without any Amendment." Addresses, &c. of S. S. Company to the King, delivered. "Copy of an Address of the Court of Directors of the South Sea Company, to the King, 30th June, 1737." "Copy of a Letter from the Duke of Newcastle, to the Sub-governor and Deputy Governor of the South Sea Company, July 29th, 1737." "Copy of an Address of the Court of Directors of the South Sea Company, to the King, 20th Dec'r, 1737." Upon reading the Petition of divers Merchants, Planters, and others, trading to, and interested in, the British Plantations in America, in Behalf of themselves and many others; praying, "That they may be heard, by themselves or Counsel, before this House; and that they may be allowed to represent to their Lordships the great Importance of our Trade to and from our own Plantations in America; the clear and indisputable Right which we have to enjoy it, without being stopped, visited or searched, by the Spaniards, on any Pretence whatsoever; and the certain and inevitable Destruction of all the Riches and Strength derived to this Kingdom from that Trade, if a Search of British Ships sailing to and from the British Plantations be tolerated, or under any Restriction, or even if the Freedom of this Navigation should continue much longer in this State of Incertainty." It was moved, "That the Petitioners be heard, by themselves or Counsel, as desired, on Tuesday next." Ordered, That the Petitioners be heard, on the Subject-matter of the said Petition, at that Time. It was proposed, "To leave out these Words ["or Counsel".]. The Question was put, "Whether these Words shall stand Part of the Question?" Ordered, That the Petitioners be heard, by themselves, before this House on Tuesday next. 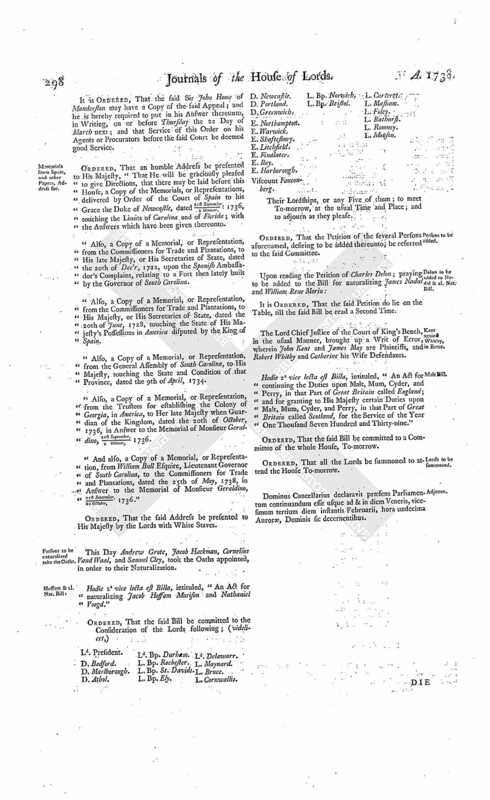 Petition of the City of London on the same Subject. 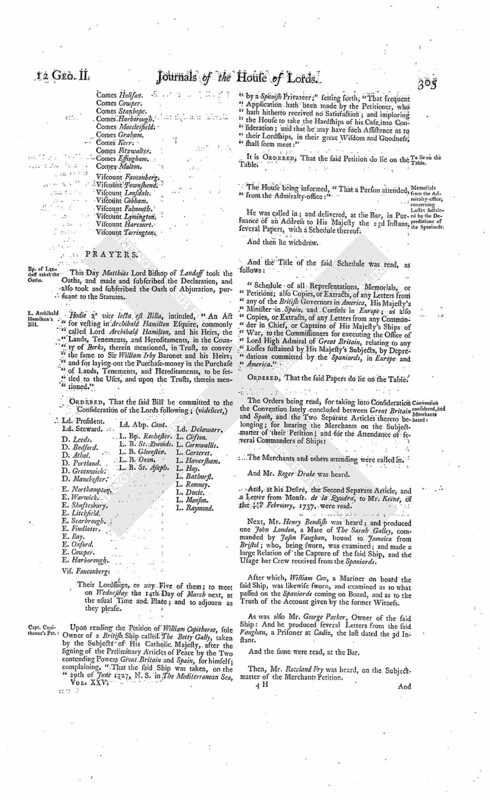 A Petition of the Lord Mayor, Aldermen, and Commons, of the City of London, in Common Council assembled, was presented to the House, and read; setting forth, "That the Petitioners, with a Concern they are unable to express, perceive the Trade to His Majesty's American Colonies still continues exposed to the Insults of the Spaniards, who continue to stop, search, and make Prizes of, British Vessels navigating the American Seas;" expressing their Apprehensions, (fn. 2) That the precarious Situation the Trade of His Majesty's Subjects to America is at present in, which is of so high Importance to the Kingdom in general, and to the said City in particular; representing the fatal Consequences of leaving the Freedom of Navigation any longer in Suspence and Uncertainty; and hoping, that the House will take it into mature Deliberation, and do therein as to their Lordships in their great Wisdom shall seem meet." Delon takes the Oaths to be naturalized. Charles Delon took the Oaths appointed, in order to his Naturalization. Hodie 2a vice lecta est Billa, intituled, "An Act for naturalizing James Nadal and William Rene Morin." Ordered, That the Petition of the said Charles Delon, praying to be added to the said Bill, be referred to the said Committee. Shipton Moyne Common, to enclose, Leave for a Bill. Hodie 1a vice lecta est Billa, intituled, "An Act for vesting in Archibald Hamilton Esquire, commonly called Lord Archibald Hamilton, and his Heirs, the Lands, Tenements, and Hereditaments, in the County of Berks, therein mentioned, in Trust, to convey the same to Sir William Irby Baronet and his Heirs; and for laying out the Purchase-money in the Purchase of Lands, Tenements, and Hereditaments, to be settled to the Uses, and upon the Trusts, therein mentioned." Address for Papers relating to Losses sustained by the Depredations of the Spaniards. Ordered, That an humble Address be presented to His Majesty, "That He will be graciously pleased to give Directions, that there be laid before this House, Copies of all Representations, Memorials, or Petitions, made to His Majesty, or His Secretaries of State, since the Treaty of Seville, relating to any Losses sustained by His Majesty's Subjects, by Depredations committed by the Spaniards in Europe or America, which have not already been laid before the House. 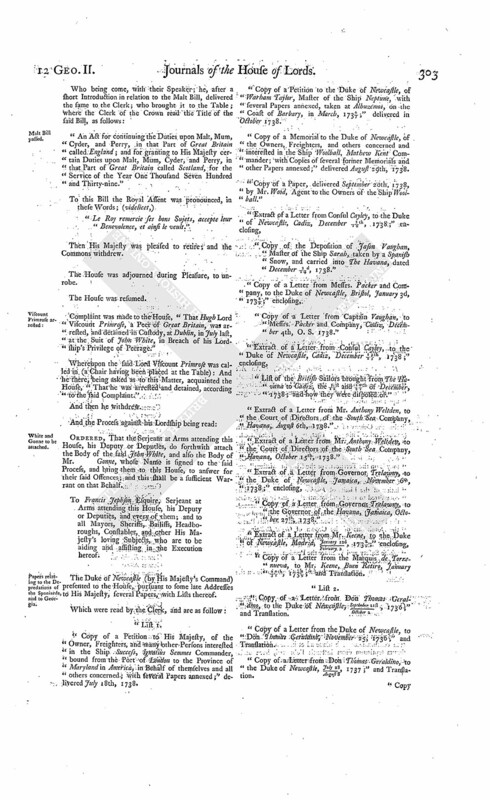 "Also, Copies of all Representations, Memorials, or Petitions, made to the Commissioners for executing the Office of Lord High Admiral of Great Britain, or Commissioners for Trade and Plantations, since the Treaty of Seville, relating to any Losses sustained by His Majesty's Subjects, by Depredations committed by the Spaniards in Europe or America, which have not already been laid before this House. Also, Copies or Extracts of any Letters from any of the British Governors in America, His Majesty's Minister in Spain, and Consuls in Europe, to the Secretaries of State, Commissioners for executing the Office of Lord High Admiral of Great Britain, or Commissioners for Trade and Plantations, since the Treaty of Seville, relating to any Losses sustained by His Majesty's Subjects, by Depredations committed by the Spaniards in Europe or America, which have not already been laid before this House. And also, Copies or Extracts of any Letters from any Commander in Chief, or Captains of His Majesty's Ships of War, to the Secretaries of State, Commissioners for executing the Office of Lord High Admiral of Great Britain, or Commissioners for Trade and Plantations, relating to any Losses sustained by His Majesty's Subjects, since the Treaty of Seville, by Depredations committed by the Spaniards in Europe or America, which have not already been laid before this House." The House being moved, "That Thomas Burke, of The Middle Temple, London, Esquire, may be permitted to enter into a Recognizance for Gerald Burke Esquire, on account of his Appeal depending in this House; he being in Ireland:"
It is Ordered, That the said Thomas Burke may enter into a Recognizance for the Appellant, as desired. The like Motion and Order, for John Percival Gentleman to enter into a Recognizance for Valentine Quin Esquire; for the same Reason. The like Motion and Order, for Alexander Ross Gentleman to enter into a Recognizance for Sir William Billars & al. The like Motion and Order, for Joseph Richardson to enter into a Recognizance for Thomas Ingoldsby Esquire; he being in Ireland. Carre, for Sir John Home. The like Motion and Order, for Ralph Carre to enter into a Recognizance for Sir John Home; he being in Scotland. Dominus Cancellarius declaravit præsens Parliamentum continuandum esse usque ad & in diem Lunæ, vicesimum sextum diem instantis Februarii, hora undecima Auroræ, Dominis sic decernentibus. Hodie 3a vice lecta est Billa, intituled, "An Act for continuing the Duties upon Malt, Mum, Cyder, and Perry, in that Part of Great Britain called England; and for granting to His Majesty certain Duties upon Malt, Mum, Cyder, and Perry, in that Part of Great Britain called Scotland; for the Service of the Year One Thousand Seven Hundred and Thirtynine." King's Answer to Address for Papers. The Lord Steward reported, "That the Lords with White Staves had (pursuant to the Order of Friday last) presented to His Majesty the Address of this House, for Copies, Representations, Memorials, and Letters, therein mentioned; and that His Majesty was pleased to say, He would give Directions, that the Copies desired should be laid before their Lordships as soon as they could be got ready. D. of Portland's Pet. referred to Judges. Langdale's Pet. referred to Judges. It is Ordered, That the Consideration of the said Petition be, and is hereby, referred to Mr. Justice Fortescue and Mr. Justice Chaple; with the usual Directions, according to the Standing Order. Comyns's Pet. referred to Judges. It is Ordered, That the Consideration of the said Petition be, and it is hereby, referred to Mr. Justice Denton and Mr. Justice Comyns; with the usual Directions, according to the Standing Order. Westall & al. Pet. referred to Judges. Sir Hew Dalrymple to amend Appeal. Upon reading the Petition of Sir Hew Dalrymple; praying, "In regard Sir Alexander Hope, Respondent to the Petitioner's Appeal, has not put in his Answer; that he may amend the same, by adding something omitted, and altering some Words therein:"
It is Ordered, That the Petitioner may amend his Appeal, as desired; he amending the Respondent's Copy. Hodie 3a vice lecta est Billa, intituled, "An Act for naturalizing Jacob Hoffham Murison and Nathaniel Voogd." The Lord Clifton reported from the Lords Committees to whom the Bill, intituled, "An Act for naturalizing James Nadal and William René Morin," was committed: "That they had examined the Allegations thereof, and found the same to be true; and considered the Petition of Charles Dolon, to be added to the Bill; and had made some Amendments thereunto." And the Question being put, "Whether the said Bill, with the Amendments, shall pass?" To acquaint them, That the Lords have agreed to the Two last mentioned Bills, with some Amendments, whereunto their Lordships desire their Concurrence. His Majesty, being seated on the Throne, with the accustomed Ceremonies; the Prince, in his Robes, in his Place; the Lords being also in their Robes; commanded the Gentleman Usher of the Black Rod to let the Commons know, "That they should attend Him immediately, in this House." "An Act for continuing the Duties upon Malt, Mum, Cyder, and Perry, in that Part of Great Britain called England; and for granting to His Majesty certain Duties upon Malt, Mum, Cyder, and Perry, in that Part of Great Britain called Scotland, for the Service of the Year One Thousand Seven Hundred and Thirty-nine." Complaint was made to the House, "That Hugh Lord Viscount Primrose, a Peer of Great Britain, was arrested, and detained in Custody, at Dublin, in July last, at the Suit of John White, in Breach of his Lordship's Privilege of Peerage." Whereupon the said Lord Viscount Primrose was called in (a Chair having been placed at the Table): And he there, being asked as to this Matter, acquainted the House, "That he was arrested and detained, according to the said Complaint." White and Gonne to be attached. 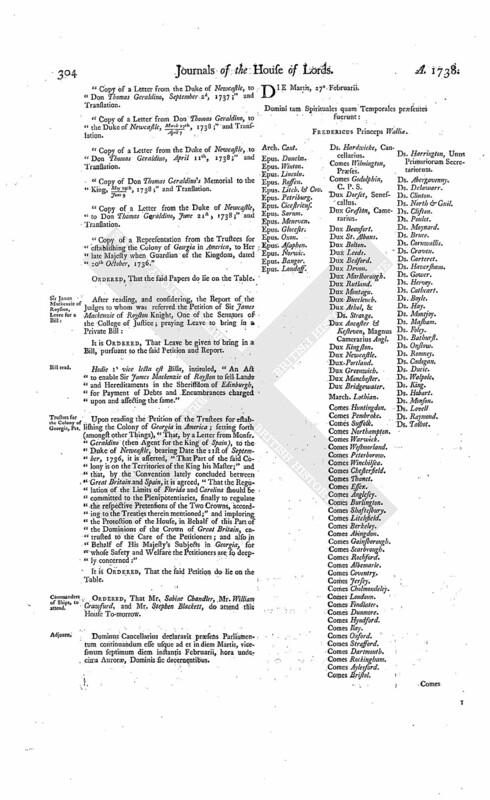 Ordered, That the Serjeant at Arms attending this House, his Deputy or Deputies, do forthwith attach the Body of the said John White, and also the Body of Mr. Gonne, whose Name is signed to the said Process, and bring them to this House, to answer for their said Offences; and this shall be a sufficient Warrant on that Behalf. To Francis Jephson Esquire, Serjeant at Arms attending this House, his Deputy or Deputies, and every of them; and to all Mayors, Sheriffs, Bailiffs, Headboroughs, Constables, and other His Majesty's loving Subjects, who are to be aiding and assisting in the Execution hereof. Papers relating to the Depredations of the Spaniards, and to Georgia. The Duke of Newcastle (by His Majesty's Command) presented to the House, pursuant to some late Addresses to His Majesty, several Papers, with Lists thereof. "Copy of a Petition to His Majesty, of the Owner, Freighters, and many other Persons interested in the Ship Success, Ignatius Semmes Commander, bound from the Port of London to the Province of Maryland in America, in Behalf of themselves and all others concerned; with several Papers annexed;" delivered July 18th, 1738. "Copy of a Petition to the Duke of Newcastle, of Warham Taylor, Master of the Ship Neptune, with several Papers annexed, taken at Alhuzemos, on the Coast of Barbary, in March, 1736/7;" delivered in October 1738. "Copy of a Memorial to the Duke of Newcastle, of the Owners, Freighters, and others concerned and interested in the Ship Woolball, Mathew Kent Commander; with Copies of several former Memorials and other Papers annexed;" delivered August 29th, 1738. "Copy of a Paper, delivered September 20th, 1738, by Mr. Wood, Agent to the Owners of the Ship Woolball." "Copy of the Deposition of Jason Vaughan, Master of the Ship Sarah, taken by a Spanish Snow, and carried into The Havana, dated December 3d/14, 1738." "Copy of a Letter from Captain Vaughan, to Messrs. Packer and Company, Cadiz, December 4th, O. S. 1738." "List of the British Sailors brought from The Havana to Cadiz, the 1st/12 and 10th/21 of December, 1738; and how they were disposed of." "Extract of a Letter from Mr. Anthony Weltden, to the Court of Directors of the South Sea Company, Havana, August 6th, 1738." Extract of a Letter from Mr. Anthony Weltden, to the Court of Directors of the South Sea Company, Havana, October 15th, 1738." "Copy of a Letter from Governor Trelawny, to the Governor of the Havana, Jamaica, October 27th, 1738." "Copy of a Letter from the Marquis de Torrenueva, to Mr. Keene, Buen Retiro, January 20th/31, 1738/9;" and Translation. "Copy of a Letter from Don Thomas Geraldino, to the Duke of Newcastle, September 21st/October 2, 1736;" and Translation. "Copy of a Letter from the Duke of Newcastle, to Don Thomas Geraldinb, November 25, 1736;" and Translation. "Copy of a Letter from Don Thomas Geraldino, to the Duke of Newcastle, July 28/August 8, 1737;" and Translation. "Copy of a Letter from the Duke of Newcastle, to Don Thomas Geraldino, September 2d, 1737;" and Translation. "Copy of a Letter from Don Thomas Geraldino, to the Duke of Newcastle, March 27th/April 7, 1738;" and Translation. "Copy of a Letter from the Duke of Newcastle, to Don Thomas Geraldino, April 11th, 1738;" and Translation. "Copy of Don Thomas Geraldino's Memorial to the King, May 29th/June 9, 1738;" and Translation. "Copy of a Letter from the Duke of Newcastle, to Don Thomas Geraldino, June 21st, 1738;" and Translation. "Copy of a Representation from the Trustees for establishing the Colony of Georgia in America, to Her late Majesty when Guardian of the Kingdom, dated 20th October, 1736." Hodie 1a vice lecta est Billa, intituled, "An Act to enable Sir James Mackenzie of Royston to sell Lands and Hereditaments in the Sheriffdom of Edinburgh, for Payment of Debts and Encumbrances charged upon and affecting the same." 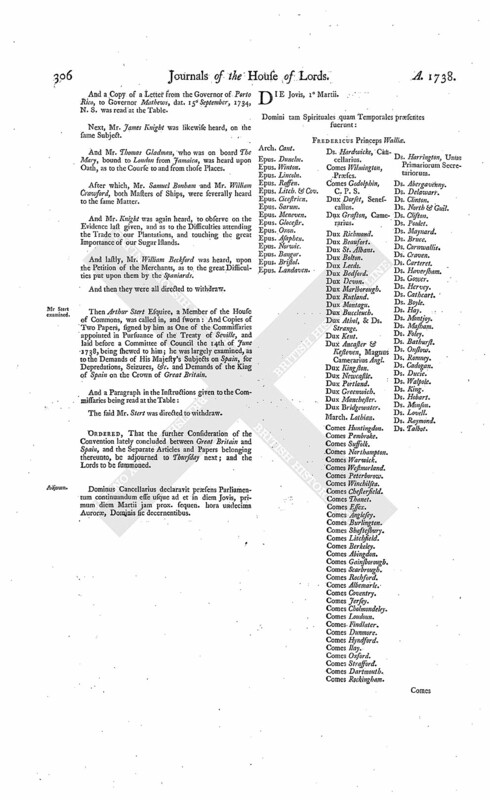 Trustees for the Colony of Georgia, Pet. Upon reading the Petition of the Trustees for establishing the Colony of Georgia in America; setting forth (amongst other Things), "That, by a Letter from MonsrGeraldino (then Agent for the King of Spain), to the Duke of Newcastle, bearing Date the 21st of September, 1736, it is asserted, "That Part of the said Colony is on the Territories of the King his Master;" and that, by the Convention lately concluded between Great Britain and Spain, it is agreed, "That the Regulation of the Limits of Florida and Carolina should be committed to the Plenipotentiaries, finally to regulate the respective Pretensions of the Two Crowns, according to the Treaties therein mentioned;" and imploring the Protection of the House, in Behalf of this Part of the Dominions of the Crown of Great Britain, entrusted to the Care of the Petitioners; and also in Behalf of His Majesty's Subjects in Georgia, for whose Safety and Welfare the Petitioners are so deeply concerned:"
Commanders of Ships, to attend. Ordered, That Mr. Sabine Chandler, Mr. William Crawfurd, and Mr. Stephen Blackett, do attend this House To-morrow. Dominus Cancellarius declaravit præsens Parliamentum continuandum esse usque ad et in diem Martis, vicesimum septimum diem instantis Februarii, hora undecima Auroræ, Dominis sic decernentibus. Epus. Landaff. Ds. Hardwicke, Cancellarius. Bp. of Landaff takes the Oaths. This Day Matthias Lord Bishop of Landaff took the Oaths, and made and subscribed the Declaration, and also took and subscribed the Oath of Abjuration, pursuant to the Statutes. Hodie 2a vice lecta est Billa, intituled, "An Act for vesting in Archibald Hamilton Esquire, commonly called Lord Archibald Hamilton, and his Heirs, the Lands, Tenements, and Hereditaments, in the County of Berks, therein mentioned, in Trust, to convey the same to Sir William Irby Baronet and his Heirs; and for laying out the Purchase-money in the Purchase of Lands, Tenements, and Hereditaments, to be settled to the Uses, and upon the Trusts, therein mentioned." Vis. Fauconberg. Ld. Abp. Cant. Their Lordships, or any Five of them; to meet on Wednesday the 14th Day of March next, at the usual Time and Place; and to adjourn as they please. Upon reading the Petition of William Copithorne, sole Owner of a British Ship called The Betty Gally, taken by the Subjects of His Catholic Majesty, after the signing of the Preliminary Articles of Peace by the Two contending Powers Great Britain and Spain, for himself; complaining, "That the said Ship was taken, on the 29th of June 1727, N. S. in The Mediterranean Sea, by a Spanish Privateer;" setting forth, "That frequent Application hath been made by the Petitioner, who hath hitherto received no Satisfaction; and imploring the House to take the Hardships of his Case into Consideration; and that he may have such Assistance as to their Lordships, in their great Wisdom and Goodness; shall seem meet:"
Memorials from the Admiralty-office, concerning Losses sustained by the Depredations of the Spaniards. The House being informed, "That a Person attended, from the Admiralty-office:"
He was called in; and delivered, at the Bar, in Pursuance of an Address to His Majesty the 23d Instant, several Papers, with a Schedule thereof. 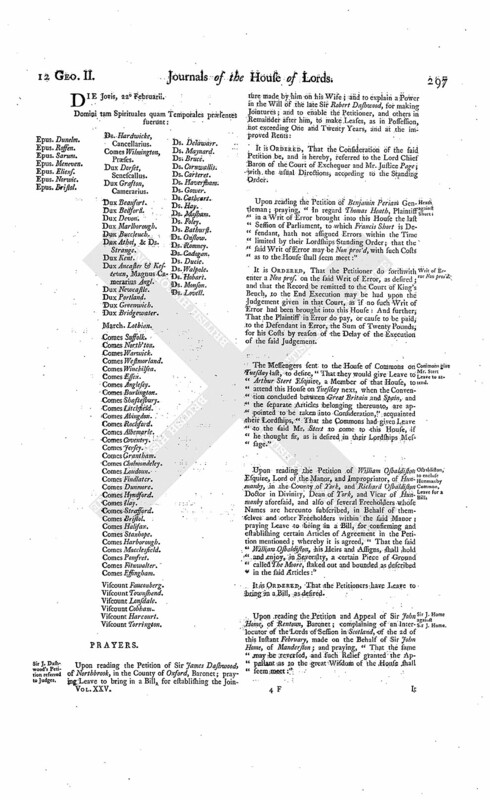 "Schedule of all Representations, Memorials, or Petitions; also Copies, or Extracts, of any Letters from any of the British Governors in America, His Majesty's Minister in Spain, and Consuls in Europe; as also Copies, or Extracts, of any Letters from any Commander in Chief, or Captains of His Majesty's Ships of War, to the Commissioners for executing the Office of Lord High Admiral of Great Britain, relating to any Losses sustained by His Majesty's Subjects, by Depredations committed by the Spaniards, in Europe and America." The Merchants and others attending were called in. And Mr. Roger Drake was heard. And, at his Desire, the Second Separate Article, and a Letter from Monsr. de la Quadra, to Mr. Keene, of the 10th/21st February, 1737, were read. Next, Mr. Henry Bendish was heard; and produced one John London, a Mate of The Sarah Galley, commanded by Jason Vaughan, bound to Jamaica from Bristol; who, being sworn, was examined; and made a large Relation of the Capture of the said Ship, and the Usage her Crew received from the Spaniards. After which, William Cox, a Mariner on board the said Ship, was likewise sworn, and examined as to what passed on the Spaniards coming on Board, and as to the Truth of the Account given by the former Witness. As was also Mr. George Packer, Owner of the said Ship: And he produced several Letters from the said Vaughan, a Prisoner at Cadiz, the last dated the 3d Instant. And the same were read, at the Bar. Then, Mr. Rowland Fry was heard, on the Subjectmatter of the Merchants Petition. And a Copy of a Letter from the Governor of Porto Rico, to Governor Mathews, dat. 15o September, 1734, N. S. was read at the Table. Next, Mr. James Knight was likewise heard, on the same Subject. And Mr. Thomas Gladman, who was on board The Mary, bound to London from Jamaica, was heard upon Oath, as to the Course to and from those Places. After which, Mr. Samuel Bonham and Mr. William Crawford, both Masters of Ships, were severally heard to the same Matter. And Mr. Knight was again heard, to observe on the Evidence last given, and as to the Difficulties attending the Trade to our Plantations, and touching the great Importance of our Sugar Islands. And lastly, Mr. William Beckford was heard, upon the Petition of the Merchants, as to the great Difficulties put upon them by the Spaniards. And then they were all directed to withdraw. Then Arthur Stert Esquire, a Member of the House of Commons, was called in, and sworn: And Copies of Two Papers, signed by him as One of the Commissaries appointed in Pursuance of the Treaty of Seville, and laid before a Committee of Council the 14th of June 1738, being shewed to him; he was largely examined, as to the Demands of His Majesty's Subjects on Spain, for Depredations, Seizures, &c. and Demands of the King of Spain on the Crown of Great Britain. The said Mr. Stert was directed to withdraw. Ordered, That the further Consideration of the Convention lately concluded between Great Britain and Spain, and the Separate Articles and Papers belonging thereunto, be adjourned to Thursday next; and the Lords to be summoned. Dominus Cancellarius declaravit præsens Parliamentum continuandum esse usque ad et in diem Jovis, primum diem Martii jam prox. sequen. hora undecima Auroræ, Dominis sic decernentibus.